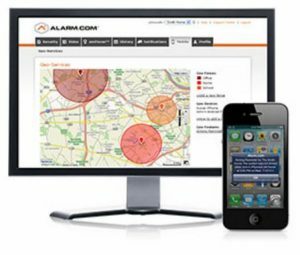 The Alarm.Com App provides a comprehensive security and home automation interactive service platform through web and mobile based applications. 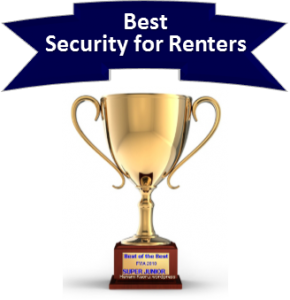 In our 2018 Alarm.com Reviews, we delve into what makes Alarm.com the leading platform for home automation and security system remote management. Their cloud-based service provides a complete security and home automation eco-system. You can monitor almost every aspect of a modern security and home automation system. Additionally, you can remotely control your system on any computer, tablet or mobile device with an internet connection. There is an Alarm.com App for Windows, I-Phones and Android devices. 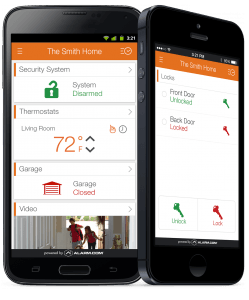 Comprehensive Security and Home Automation App that sets the bar for Interactive Security and Home Automation. Already have Alarm.com? Please share your experience in the comments below! 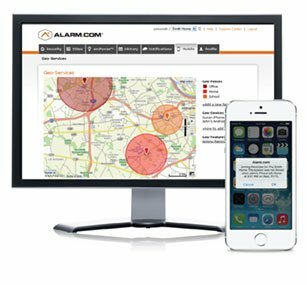 Founded in 2000, Alarm.com is one of the oldest providers of interactive security solutions and is responsible for introducing remote notifications and alerts through GSM cellular communications. They released their first mobile application in 2007. It enabled a full spectrum of remote services which included video surveillance, home automation, and energy management solutions. Based on customer Alarm.com reviews, they responded with further enhancements in 2011 by incorporating Smart Scheduling, Geo-location automation, and their wellness applications . However, they did not rest on their laurels, in 2015 they launched their own Alarm.com thermostat and integrated software for the new Apple Watch! 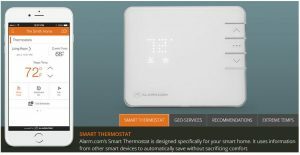 Not one to rest on their laurels…Alarm.com unveiled a new Smart Home Thermostat at the CES show in January. Slated to hit the home security market in the spring, the new thermostat measures humidity levels and can even detect issues with the HVAC system before they become problematic. This can prevent minor maintenance issues from escalating into far more expensive predicaments such as frozen pipes or complete system failures..
Also slated for 2018 is a full home media entertainment interface with audio industry giant- Sonos! Never one to rest on their laurels, they responded to comments from online Alarm.com Reviews and made it even easier for Android users to log in to the Alarm.com App by including fingerprint authentication capability for supported Android devices. Now, you can access their powerful interactive capabilities with a swipe of your fingertip! Of course, they still have the 4 digit access code, as well. Alarm.com is also working on software enhancements that will enable interfacing with drones that can deploy a camera-equipped drone to the location of an activity to provide video footage at the location of an intrusion or event. Alarm.com continues to expand their 3rd party product integration in 2017 with exciting new home automation technologies and innovations. The Alarm.com Slim Line Doorbell Camera by Skybell provides a more practical form factor (for doors with narrow frames) and a more modern aesthetic while delivering comparable features and benefits to its predecessor the Skybell HD Doorbell Camera. 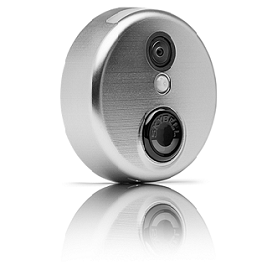 This unobtrusive doorbell cam is fully integrated into the Alarm.com ecosystem and it will enable one to see who is at the door, get motion activated text or e-mail alerts and even hold a two-way conversation from anywhere in the world through the Alarm.com App. As we enter the “dog days of summer”, Alarm.com is extending their water management control capabilities to include a couple of the most popular yard irrigation systems. Now you can manage your lawn maintenance in Ohio while sitting on a beach in Maine…through your Alarm.com App. Alarm.com will now integrate with the Rachio Smart Sprinkler Control and the Bird Irrigation Controller to help you keep your lawn lush and green no matter where you are. Whether you are a fan of the Bee Gees or Blue Oyster Cult, you can program your Alarm.com App with a “Scene” that will turn on the lights, disarm your system, adjust the thermostat and activate your favorite streaming playlist or radio station automatically when you integrate Legrand’s On-Q smart audio system. Alarm.com reviews continue to praise the Alarm.com App for the stability, ease of use and innovation that continues to set Alarm.com apart from the rest of the home automation management systems in the market. …and is able to interface with Z-Wave controlled LiftMaster garage door openers and Yale, Kwikset and Schlage lock sets. 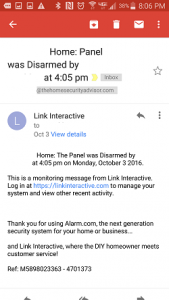 Text and E-mail Alerts and Notifications- Homes equipped with Alarm.com interactive capability can be programmed to send an e-mail or text to let you know when a specific activity occurs. For instance, you can program your system to let you know when the kids get home from school (or can even be set up to let you know the system has not been disarmed by a specific time) or alert you that a package has been delivered. Additionally, you can place notification sensors on medicine, liquor or gun cabinets to enable you to keep tabs on sensitive areas. This can also serve an important wellness functionality by monitoring movement and activity (or lack of) throughout the house. Arm/Disarm Remotely- Need to allow access to your home-but, don’t want to give out your code? Your system can be disarmed…and then re-armed remotely from your smartphone. Check Alarm Event History- Want to know when the system was disarmed? You can check the event history right from your computer, tablet or mobile device. 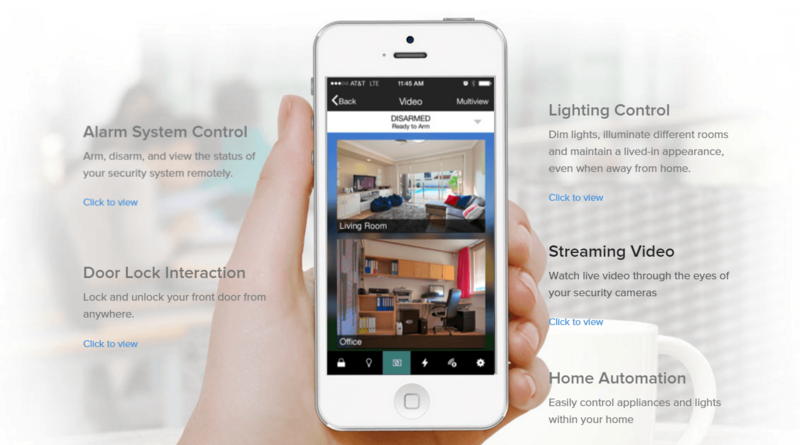 Not only does the Alarm.com provide a full spectrum of interactive security features, but their emPower® program provides one of the industry’s’ most powerful home automation platforms. Door Lock Control- Not only can you control access by being able to lock and unlock the door remotely, but you can assign new lock codes to enable guests, babysitters, dog walkers or contractors access in your absence. Control Lights & Lamps- Never come home to a dark home again. Now you can turn on lights and even small appliances remotely. Additionally, you can pre-program lighting schedules based on your normal activities. Going to be away from the home for awhile? You can take advantage of the intelligent lighting functions available in Smart Schedules which will automatically vary your schedules so that there are no predictable lighting patterns to tip off would be intruders. Energy Management- Turn up the heat from the car on the way home from the ski slopes and it’ll be toasty warm when you get home! Not only can you program your system the Alarm.com App, but you can fine tune your home energy management system and optimize savings with their exclusive Predictive Performance Energy feature. In addition, you can take advantage of their proprietary algorithms to calculate the estimated savings you would realize by making temperature and scheduling adjustments! Video Monitoring- You can look in on the kids, pets and loved ones ….from the basement, while you’re on the road, at work or even thousands of miles away on vacation.You can enable “triggers” to receive e-mails or video clips when a door is opened, an area is accessed or a package is delivered, Just set up sensors with rules that govern video activity and initiate specific system responses. Moreover, you can store clips and video archive the clips for review later. Continuous Video Recording – While the standard video monitoring solution will meet the needs of the vast majority, some users may require an even more comprehensive video solution. If you are looking for 24/7 high definition video recording and remote access, check out Alarm.com’s SVR (Streaming Video Recording) solution. Alarm.com offers some unique features in the Alarm.com App that are unavailable in some of the top competitors such as the SimpliSafe App and the ADT Pulse Android App. It is difficult to find an Alarm com review that doesn’t praise their innovative Geo-Services and Crash and Smash features. Geo-Services– This is the next generation of home automation. It enables your system to perform certain functions based on your location. It does this by interfacing with the GPS service on your mobile phone. Essentially, it creates an interactive, cloud-based home security ecosystem and enables the user to create a number of “Rules” based on the phone’s location. For instance, you can program the system to arm automatically, turn off lights and turn the thermostat down when you (and your phone) leave a pre-defined distance from your home. Additionally, you can “turn off” cameras when you enter the home-affording you additional privacy. This feature truly puts the “automation”…in home automation! 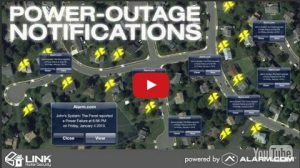 Power Outage Notification – A system equipped with Alarm.com will send a text or e-mail notification if the system loses power. This can be critical in a situation where there is medical equipment operating, water pumps or temperature control is important. An alert will enable you to take measures to power critical equipment-such as getting someone to start the generator. Crash and Smash– Security systems have evolved into sophisticated whole house automation technological masterpiece. However, the means by which the common criminal defeats the average wireless home security system is decidedly unsophisticated. Almost all security systems provide a minimum 30-second delay to enable you to disarm the system when you get home. An intruder knows that they have 30 seconds to identify the location of the panel….and destroy it before the alarm is activated and a signal is sent. Hence the term…Crash and Smash. Alarm.com’s patented, Crash and Smash technology identifies when there is a breach in the system, and no corresponding “disarm” code is received. This technology ensures that the authorities will be notified, even if your system is destroyed. The Alarm.com App now enables voice control of certain functions of the smart home through Amazon Echo. Now you can ask Alexa to turn off the lights, activate the alarm system, turn down the heat and lock the doors with voice commands on the Amazon Dot, Tap or Echo. Alexa can even control multiple functions simultaneously. Just log into the Alarm.com App and automate a series of events which will tie into a single command. Additionally, Alarm.com now integrates with Apple TV and enables one to request Siri to display video feeds on the screen through the Apple TV App. 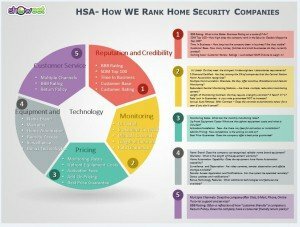 Truly, Alarm.com is positioning itself at the forefront of the SHaaS (Smart Home as a Service) industry and has become the leader in home automation and security integration. For details on how they can help you take home automation to the next level – check out Frontpoint or Link Interactive. Alarm.com recently updated the App to make it even easier to control your home security system on your mobile phone. In the new iOS 10 update, the iPhone Today Screen will include a shortcut to the Alarm.com shortcut-with up to 12 commands for your most common function and scenes. The capability to add widgets is also available for Android users. You can control entire scenes (a series of system actions controlled by a single command i.e. arm system, turn off lights, lock the door, turn down the heat) right from the home screen without the need to open the app! These enhancements make it even faster and easier to use the award-winning Alarm.com interactive home automation platform. How does the Alarm.com App rank against the competition? To assess how Alarm.com fares against the competition, we compiled the Google Play ratings by Android users and the iTunes ratings from Apple users of 5 major home security interactive Apps. We think the numbers pretty much speak for themselves. Clearly, Alarm.com is the interactive mobile app of choice! 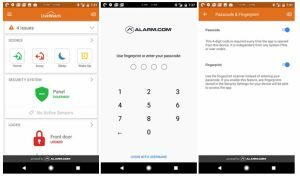 Some companies have even begun to scuttle their own proprietary mobile apps to take advantage of the more stable platform and ongoing research and development of the Alarm.com App. Protection One has recently transitioned from their e-secure platform for this very reason. The Alarm.com App is available for download on iTunes and Google Play. You can easily activate your account once it is set up with your Alarm.com security provider. The Alarm.com App is very intuitive and the user experience is rated favorably – 4.4 on Google Play and a 3.5 on iTunes. Navigation is icon and tab-based…and there is almost no learning curve to be able to move from task to task. 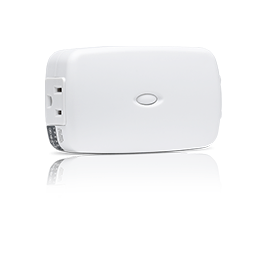 This enables you to observe cameras, open doors, turn up the heat and turn on lights right from the palm of your hand! 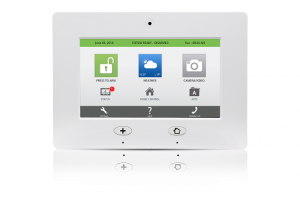 It creates a fully integrated system which enables both security and home automation functions to integrate seamlessly. For instance, one can create a rule that shuts off the heating system and activating lights if a smoke detector or carbon monoxide were activated. This would prevent the home heating system or air conditioning system from spreading deadly noxious fumes and light the way to safety. 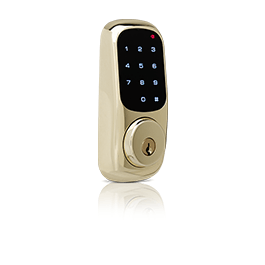 Of course, you can use rules for more basic functions such as turning on a light when you unlock the integrated door. In addition, you can create a whole series of events. For instance, one create a scene which would turn on lights, turn up the heat and start the coffee when the system is disarmed from the bedside in the morning! Moreover, you can set up scenes to work based on a set time with the Smart Schedule function. In this instance, the same events are tied into the scheduled times programmed into the system. Don’t like too much structure or perhaps a bit forgetful at times? Program your system to let you know if you forgot to turn off lights, shut the garage door or arm your system once you move beyond a pre-configured distance from the home. Once you move beyond the geo-fence parameters, the system will send a text or e-mail notification to remind you. Alarm.com practically pioneered the interactive security industry and has done an exceptional job of integrating security and home automation features into an App that gives you control of almost any function at your fingertips! 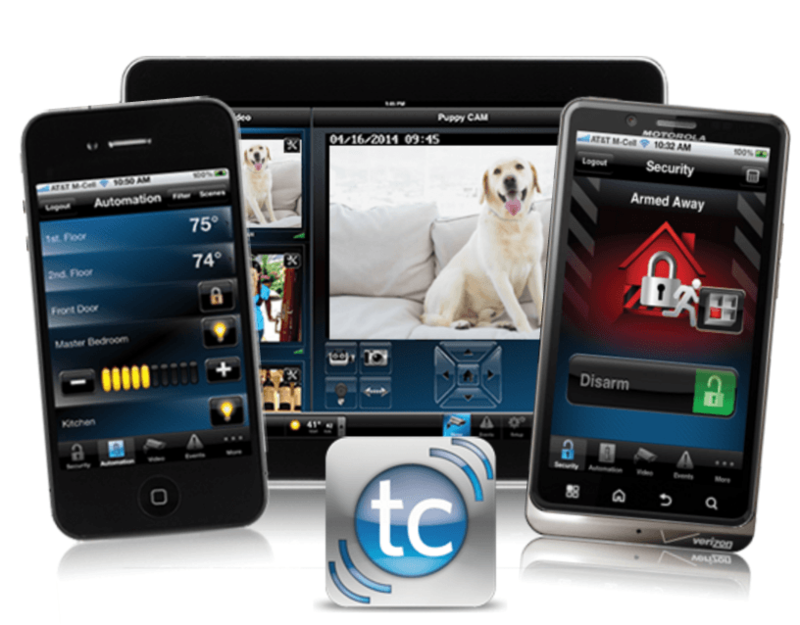 The Alarm.com App supports an incredibly vast array of security and home automation products. The system will support any security sensors that are compatible with these companies. 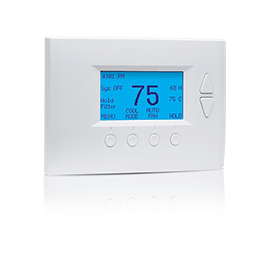 You can integrate the following lighting, appliance control, thermostats. Evolve – Appliance modules, wall switches and outlets, dimmers. GE – Appliance modules, wall switches and outlets, dimmers. You can use the Alarm.com App to control most video cameras. Does the Alarm.com App work with Landline Service? The Alarm.com App does not work with just landline monitoring. 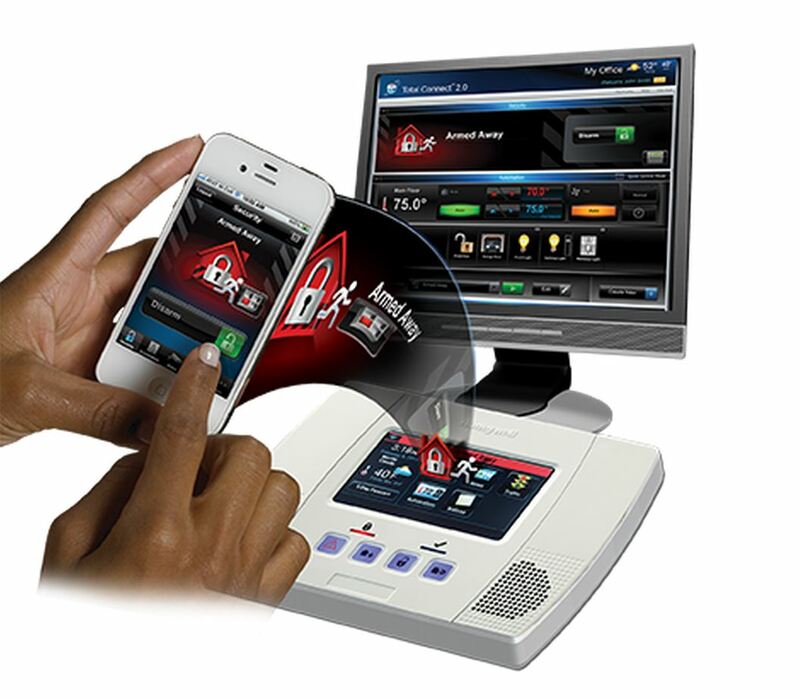 For full functionality, cellular and cable service is optimal for security systems using the Alarm.com App . While some Alarm.com reviews might complain about the additional expense of a cellular connection, most homeowners find the features that come with the Alarm.com app far outweigh the additional costs. Let us know how you feel in our section for Alarm.com Reviews, below! In summation, Alarm.com has created an App which is the yardstick by which all other competitors are measured. The app is intuitive- with a user-friendly interface that makes it easy to operate and set up with little to no experience. Moreover, it is a stable platform that is compatible with many of the most popular security and home automation companies and brands of equipment. Ongoing research and development ensure that the product continues to expand the feature set and develop relationships with other companies. It is available as a stand-alone product with some companies such as Armorax, or available as an advanced monitoring feature with companies such as Frontpoint and Link Interactive. If you are ready to give it a try you can take advantage of a Free 30 day trial with two of our Top Alarm Companies – Frontpoint and Link Interactive. If you already have a system equipped with the Alarm.com App, share your favorite features and experiences in the review section. It should be noted that Alarm.com provides products and services through a distribution network of 3rd party authorized dealers. Service issues or technical concerns should be handled by the dealer that is providing the product or service. Thank you for visiting. Please feel free to share your comments and feedback on Alarm.com Reviews on the 2018 Alarm.com App, below.